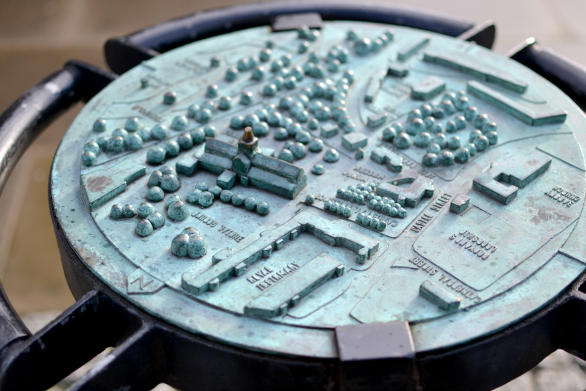 Are you ready to discover another city through my lens? 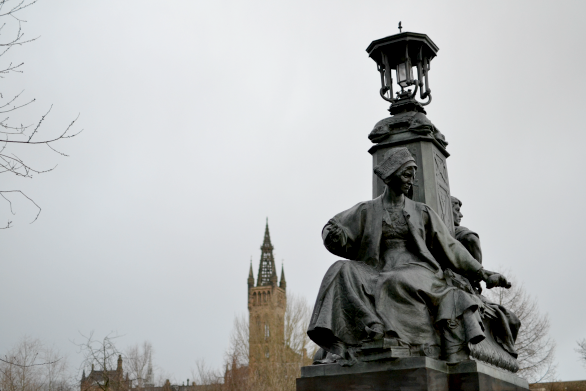 Today, I have a little bit of Glasgow for you! 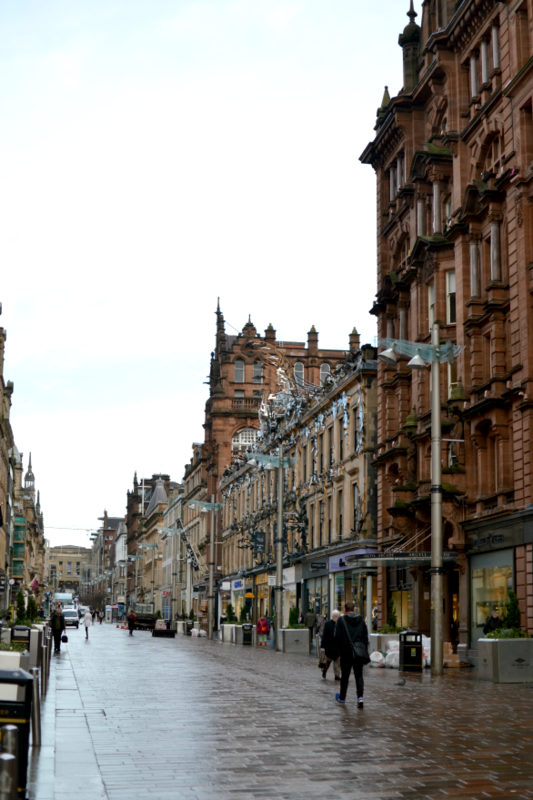 During our 5-day trip to Edinburgh, we decided to trade the Scottish national capital for its style capital. 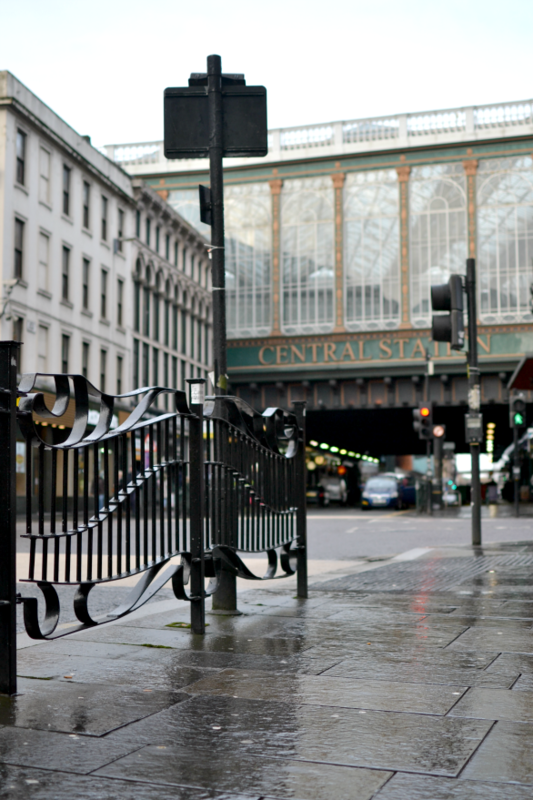 We spent about 8 hours wandering around Glasgow trying to fit in as much of our to-see list as we could. Unfortunately the weather wasn’t in our favor and we got rained on a couple of times, but I still managed to get a few nice photos of the day to share with you! As soon as we left the station I knew why Glasgow is referred to as Scotlands fashion centre. Only in London and New York did I ever see so many different stores to shop. 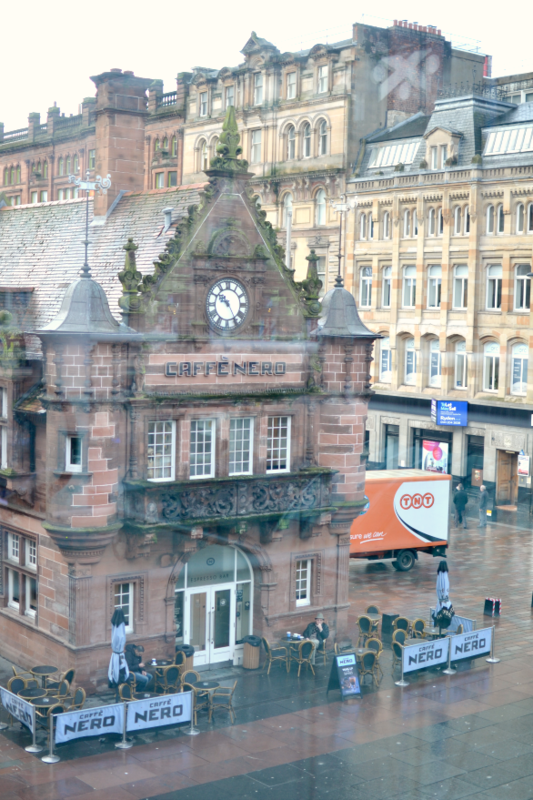 We spent a little time on Buchanan street and in the Saint Enoch shopping center. I fell in love with a another blue jacket at Ted Baker, which was 70% off, but I managed to stay calm and leave the store before any more damage was done. My wallet couldn’t take another hit and we had only been in the city for two minutes. We went up to Harrods in Saint Enoch and enjoyed watching the model trains and life sized stuffed animals. Harrods was a welcome flashback to our city trips to London and we made a deal to maybe return later this year. After a slow morning it was time to really get going. 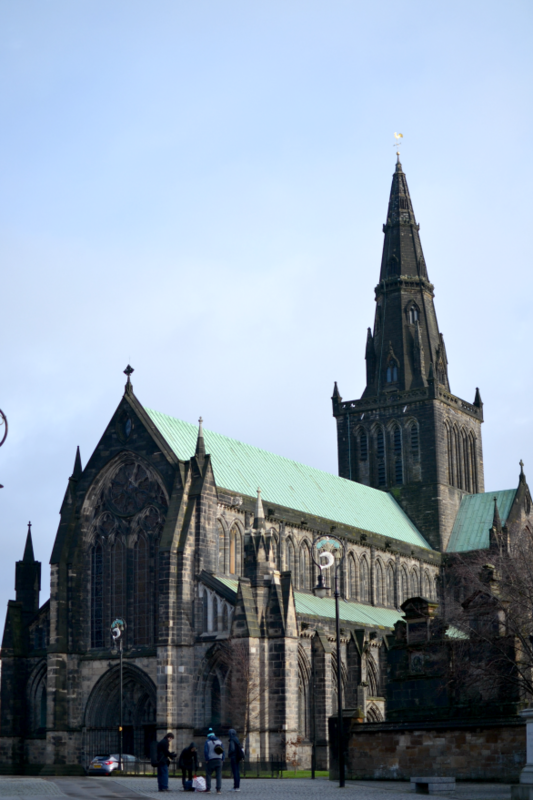 We walked from Argyll street to the Glasgow cathedral, build between 1136 – 1197, and the necropolis. 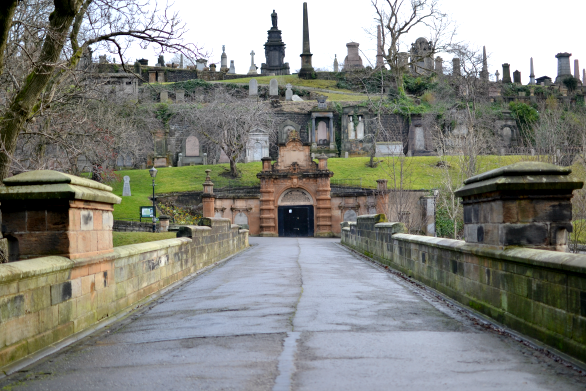 There was a filming crew at work in the cathedral and the gates to the necropolis seemed to be closed. A little bit disappointed we were already on our way back when an elderly man came to us and showed us an alternative way to get onto the site. 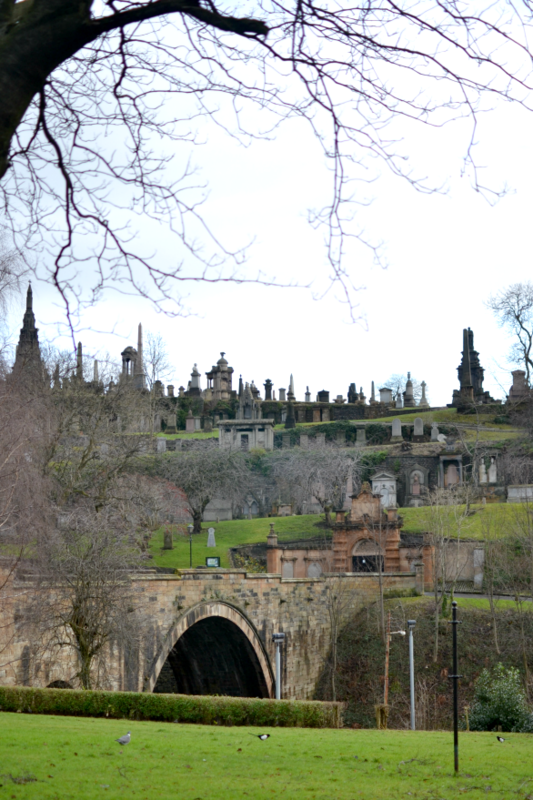 The necropolis stems from Victorian times and the slight fog and drizzle made the experience all the more eerie. When the weather was about to take a turn for the worse we headed back to town for lunch and to discuss our afternoon plans. 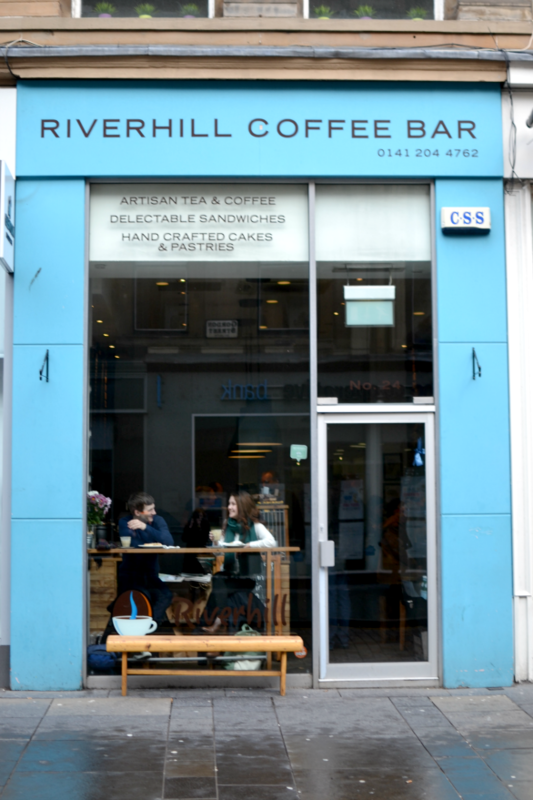 Finding coffee is not a problem in Scotland. 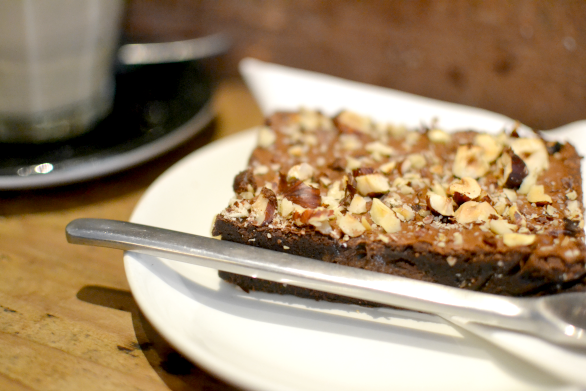 We sought ourselves a seat in the Riverhill coffee bar on Gordon Street and enjoyed a nice warm cuppa and I had the best brownie in my brownie-history. And that’s a long one! The place was relatively dark so I couldn’t snap a good picture of the latte art they did, but I’m sure you can imagine something. I was wondering if it’s an obligation to learn how to make latte art before you can work as a barista in Scotland. For real guys, they all know how to do it! Later on we also stopped by the famous Willow tea room on Sauchiehall street, but the fact that I’m not including any of it in this post might say enough. We didn’t get to see what this tea room is actually famous for: its’ amazing architecture and interior, which I thought was a bit of a shame. Also on Gordon street is the Steamer Trading cookshop. I seriously would go back to the UK solely to shop here. Their range is absolutely amazing as they offer the best of British housewares. Orla Kiely, Emma Bridgewater, London Pottery Company, Sophy Allport, Royal Worcester, … I could keep going! And I could kep buying. 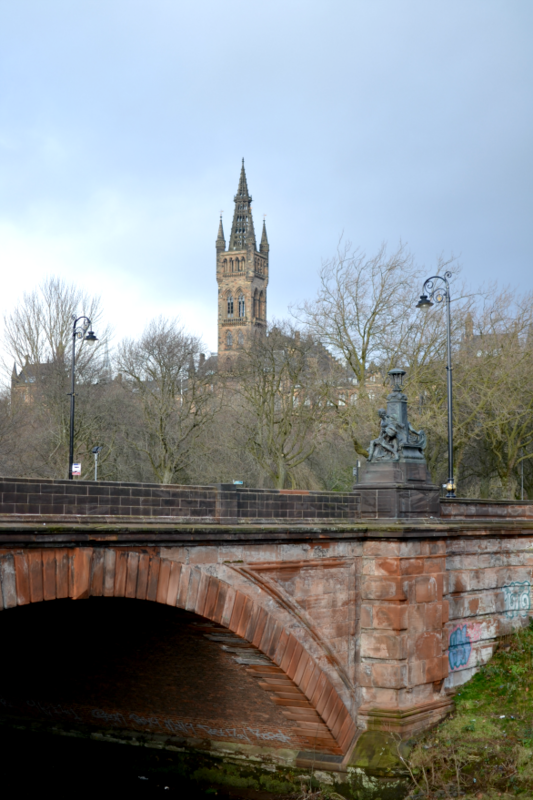 After lunch, we walked all the way across town to Kelvingrove park. Our original plan involved the park, a visit to Kelvingrove Art Gallery & Museum and then a further hike down to the Riverside Museum. The latter we eventually didn’t do. 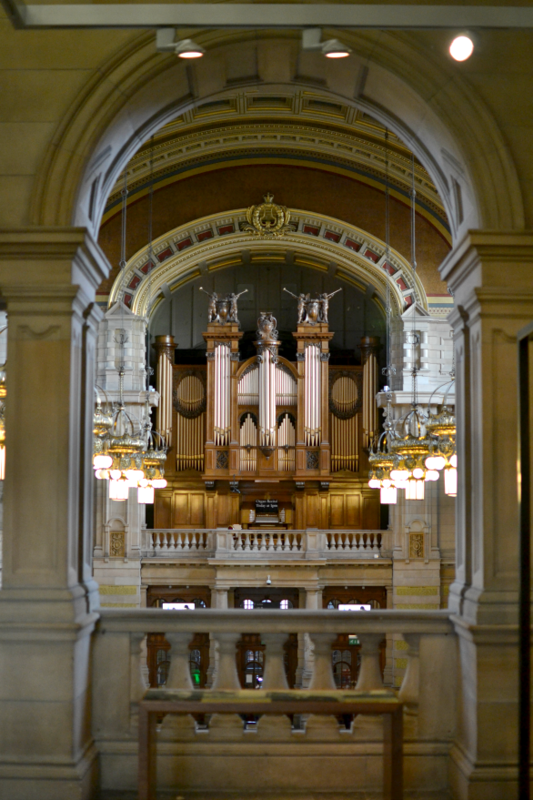 By the time we got to Kelvingrove park, the weather got so bad we stayed inside the museum for the rest of the afternoon. Not that it was unpleasant, on the contrary, just as we arrived the daily organ recital started so we got to see and hear the more than 100 years old Lewis & Co. organ in action. It was a remarkable performance! In the Museum’s collection you’ll find a.o. Salvador Dalì’s “Christ of St John of the Cross” and work by the Glasgow Boys. Our day in Glasgow ended too soon. 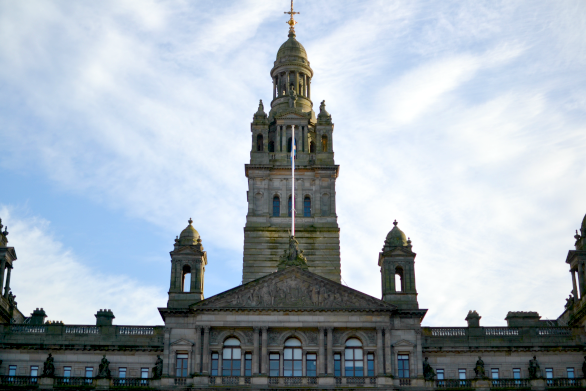 To be honest, I didn’t know much about Glasgow before and I still don’t know much about it now. I feel like it is one of those cities that you simply cannot capture in just one day. It’s a place that you have to get to know before you can really fall in love, and we didn’t have to time to get acquainted. For us, the bad timing of our visit, a Monday in January, spoiled a lot of the fun. Museums and buildings were closed, it was cold, wet and dark by 5 pm. But the early evening turned out to actually be the best part of our trip. And I secretly have kept that part to share in a separate blog post. Stay tuned! I dream of the days I’m able to visit such old, lovely places. We don’t have anything quite so old here in the US! That cathedral is gorgeous! your travel photos are always amazing! beautiful pictures, thanks for sharing! 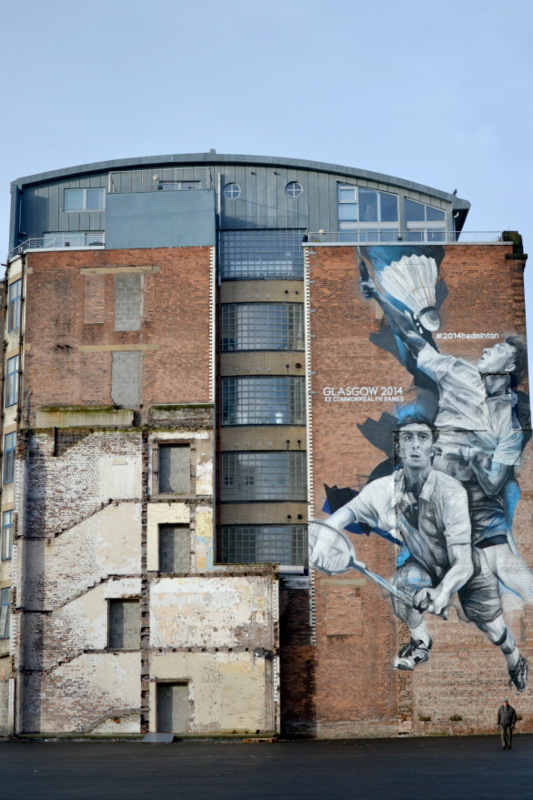 glasgow is on my bucket list. One day! Oh wow that organ is in a museum? So beautiful! 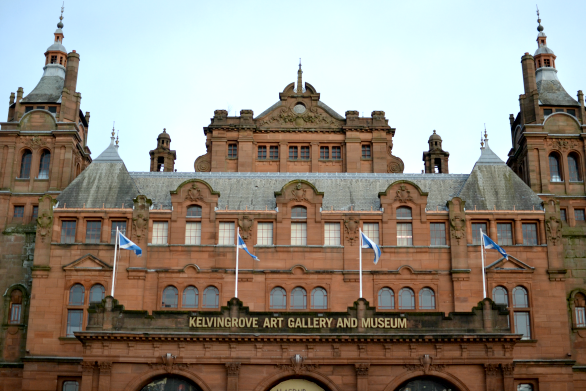 What an interesting feature 🙂 It’s interesting, we have a place here in Brisbane called Kelvingrove, I wonder if it takes the name from the place in Glasgow? Wow, what a gorgeous city, even in the rain. Sorry your trip was so short, I hope you get to return soon! These pictures turned out fantastic. I just love wandering around old cities like this. I need to get back to Europe. 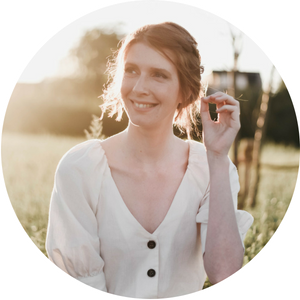 I do love these travel posts from you.